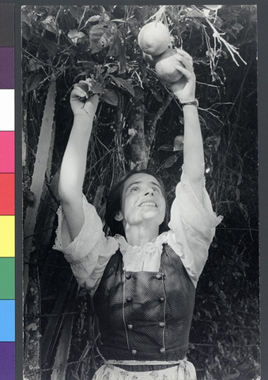 JDC - Archives : Settler picking fruit in the refugee settlement. Search > Search Results > Settler picking fruit in the refugee settlement. Title Settler picking fruit in the refugee settlement. Description A refugee settler picking fruit in a grove in the Sosua settlement. "From Tyrol to Sosua and its orange trees"